The Ultimate Nitrous, Heads up, Bracket Racing, T/Stop and Street Carburetor!! SV1- A Perfect Uncompromised Venturi shape. Lightweight! SV1’s are 10.2 lbs. to 8.0 lbs. (dependent on cfm). SV1’s are 3 to 5 lbs. lighter! (13.2 lbs. is typical for Dominators and 10.5 lbs for 4150’s). NO SPECIAL REGULATORS or FUEL LINES REQUIRED. It simply bolts in place of your current 4150 or Dominator carb. With 12 World and National Records and 9 Championships already under its belt in its debut year, the new Patent Pending – Pro Systems SV1 Series (SV- Single Venturi) line of carburetors is the most innovative, power producing and throttle responsive designs available in carburetion today. The SV Series line of carburetors are designed for maximum performance in all categories of operation. The SV1 is designed for Street use applications, High end bracket racing, Class racing and Nitrous applications when maximum power output and all around clean crisp and predictable performance from a program is required. The SV1 is a bit more expensive than our 4150 and 4500 series carburetors, so weigh your needs before considering the purchase. Our 4150 and 4500 series carburetors are we feel, the best “bang for the buck” value in the performance carburetor world. But if you are class racing or your program is maxed out or falls into the category of having specific issues that the SV1 can cure…read on. The SV1 utilizes a single venturi with special port layouts and very high cfm ratings that were previously unattainable. Due to its high amounts of signal and shift recovery the SV1 uses 4150 style 2 circuit metering blocks. There is no intermediate circuit required to assist in throttle response and shift recovery (like most 1050 cfm and larger four barrels prefer and require). 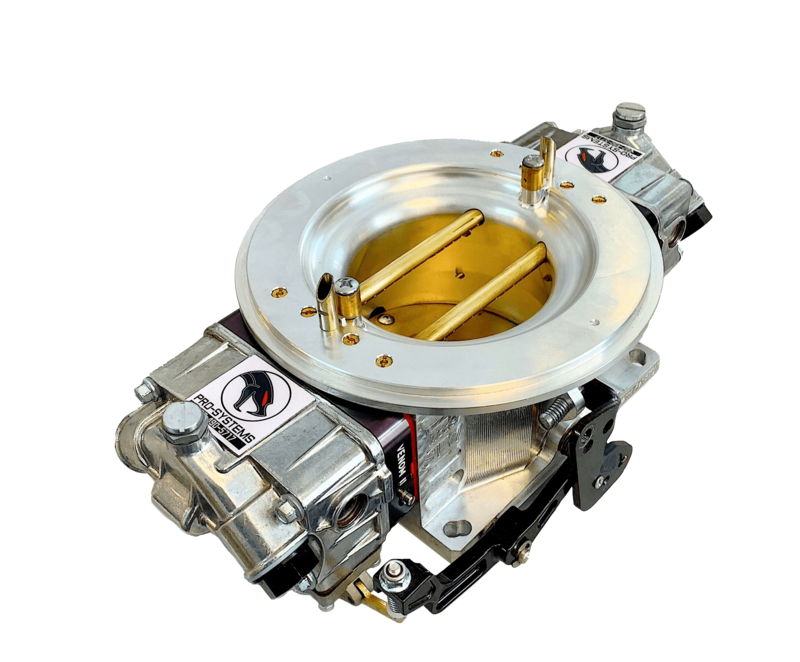 The unique quadrant tuneable SV1 booster design (which allows your main jetting to effect each quadrant or corner of the carburetor) has an exceptionally low lift point and the throttle shaft and blade does not impede signal generation, so the SV1 offers previously unattainable levels of low speed and shift recovery signal. As you roll into the throttle on other designs, the throttle blade is in the way of the booster until it gets to wide open throttle. On the SV1, the booster begins receiving signal the moment the blade even begins to open. This offers faster priming of the metering system so the SV1 will jump right up on even the tightest converters. It also gives the SV1 incredibly smooth and very nice driveability. You will be impressed by how nice the design drives and idles. The amazing idle quality is simply a result of a better layout. You see on four barrel designs, the backside of the blade only allows in “clean air”. You really only have an opening at the front and rear of the blades to atomize the idle fuel, the sides of the blades (inline with the shaft), stay snug to the venturi at all times, acting like a divider. But there is another divider. On all four barrel designs, zero or very little fuel can make it to the opposite side of the blade as the throttle shaft acts like a drip rail and (divides) cuts the fuel off from traveling to this “clean air” side. So on four barrel carburetors, only the outside edge of the blade gets fuel. The inside edge towards the center of the body gets no fuel and only passes (or mostly passes) clean air into the engine. So half of the air entering the engine is improperly lean. To compensate, on four barrel carburetors, the fuel port side of the blade must be kept improperly rich to get a good “average”. Clean air is the enemy in an engine as it typically stays clean as it easily travels through the intake in the direction of any cylinder or cylinders it wishes to feed. On the SV1 the front half AND the rear half of the blade are exposed to fuel delivery ports so there are no “clean air” openings available to bypass these idle fuel ports (so no stray “clean air” streams can occur). On the SV1, every place where air comes into the engine, offers mixture screw controllable atomized fuel (it’s also unblocked as there is no throttle shaft divider keeping half of the blade from access to a fuel port). This idle fuel is then drawn around the perimeter of the very large blade and is atomized over this very large surface area and that really improves the idle quality and evens up the distribution. This much improved idle quality/atomization configuration is very important to Nitrous applications as it keeps your cold nitrous plugs from fouling out, so they stay clean and ready to go. It’s great for street and bracket racing/throttle stop cars too. Another advantage to the single blade design is also obvious. Four barrel carburetor designs require the throttle shaft and blade to be located directly under the center of the booster. This layout impedes the boosters ability to quickly respond to air speed changes. The SV1 uses a booster design that does not rely on a signal generating center (like an annular, aerosol or dog leg booster). So on the SV1, the throttle blade and shaft location are no longer a factor. On the SV1, the whole booster length generates signal and because the blade and shaft are no longer a “signal blocker”, when air speed suddenly changes (during a shift or the engagement of nitrous) you get more instant response to these changes and faster shift recovery time as a result. This reduces lean spikes. So you can stand on your nitrous tune up even harder without worry of going lean on the shifts or during nitrous engagement and encountering a loaded nitrous backfire. This also makes the carburetor very consistent for bracket racing and throttle stop type applications as well. SV1’s power Australia’s Fastest Street car!! A 7.18 @ 191mph!! Trick and Mansweto – Our 1500 plus horsepower Naturally aspirated 694 c.i. engine with dual SV1’s, these carbs just explode out of the gate!! We reset the World Record by a tenth!! WINNER FIRST TIME OUT! Kenny Johnson – We made our fastest pass ever with the SV1 (A 5.53) and won the Real Street class. This carb leaves HARD!! Its over a tenth faster in the eighth mile! Jeff Ledford IHRA Top Dragster Champion – “The SV1 is on my Rislone sponsored Top Dragster and for good reason. BACK TO BACK against my best four barrel, the SV1 ran a 4.62 against the four barrels 4.69 Thats a big power gain at those speeds. BUT as a throttle stop carb, its deadly!! # 1 Qualifier in its debut in Quick Rod at the IHRA Northern Nats. Its just an amazing carburetor, the most responsive and consistent carb I have ever owned. Lance Flake of Quick TImes Racing – The SV1 “right out of the box” cranked up and idled like it had been on the engine forever. It picked up 3 tenths from the customers carb. Thanks for a great product again! David Reher @ Reher-Morrison – Its unbelievable how you can load and “whack it”. It responds to the throttle like I’ve never seen and “idles like a dream”. The SV1 built for our 565 c.i. Super Series showed an AVERAGE increase of 17.5 h.p. throughout the pull over the four barrel carb and was up 33 lbs of torque and 32 h.p. at 5000 rpm!!. Chris Brisebois – A pair of SV1’s picked us up 26 h.p. and 23 lbs of torque on our 439 c.i. small block versus a pair of dialed in 1150’s. Peak power is now 948 h.p.! Phil Stewart – I have had them all on this engine over the years. This SV1 has a huge throttle blade YET the response is sharp as hell, its like injection the throttle response is so fast! Mark @ Panhandle Performance – Sure the SV1 made 15 more h.p., BUT from off idle to wide open throttle that Air fuel ratio stayed perfect (no matter the throttle position)! The SV1 outperformed everything we tested it against. But in all my years, I have never seen a fuel curve so PERFECT! Its an amazing design, congratulations. Darin Morgan (R and D Manager @ Profiler Products) – The SV1, “I knew you were a bit of a genius, you have really outdone yourself with this bad boy, its the baddest thing I’ve ever seen!”. Jon Kaase of Jon Kaase Racing Engines – “We just ran an SV1 on a customers 1100 h.p. engine. Its an amazing carburetor, it really is, the way it idles and rolls through the throttle AND it showed us a 15 h.p. gain!”. Ralphs Auto, Butler, PA. – We A-B-A tested our SV1 against a name brand competitors four barrel carb, both custom built for our 3200 lb. 632 Nova. The four barrel ran 8.77, the SV1 ran an 8.57!! The moment it left (wheels high in the air) we knew it was on a pass. Chris Wheatcraft – On Indy Cylinder Heads dyno, our 655 Predator headed engine with SV1’s gained 65 h.p. over a set of stock carbs and 55 h.p. over a set of custom built four barrel carbs! Our jaws just dropped! Idles great, rolls in the throttle perfect and torque was up 58 lbs!! Greg Tubbs – I gained a tenth and 2 mph in the eighth with my SV1, PLUS it’s consistent..I made three test passes all three were 5.62’s! Mike Galley of Horsepower TV – The SV1 is an awesome piece, its almost too beautiful to put on an engine! Todd @ Huntsville Engine – I have an SV1 for my Dragster, BUT we have been using it at the shop and everytime we put it on an engine we see 10-15 more h.p. gain over four barrel carbs. From 429-460.com forum – maddmattmustangs – I drove a friends SV1 equipped street car today, 527 c.i. with a BIG 750 roller cam, idles at 725 rpm! The SV1 never stumbles, never hesitates..all I have to say about the SV1 is WOW! Joey Villeneuve – We gained a tenth and 2 mph! We also picked up .04 in the 60 foot times going from a 1.18 to a 1.14!! Jill McSwain – Our SV1 on our Bickel Firebird Top Sportsman car gained a tenth and 3 mph over a competitors custom built carb. Our SV1 ran 7-5.14’s in a row and we won our IHRA Top Sportsman race on our first time out!! Its the fastest most consistent carb I have ever owned. Jon Konkle Racing Engines – We took off Dual injected toilet bowls and installed a Single SV1. Our 712 c.i. engine made more power with one SV1 over Dual toilet bowls @ 1322 h.p!! The SV1 Series uses throttle blade sizes as small as 3.74 inches (95mm) and cfm ratings starting at 1100 cfm for 4150 series manifolds. The SV1 for Dominator intake manifolds, uses the 110 mm blade and the 115mm blade as the two most popular sizes for most applications above the 700 h.p. level. The 95mm blade version will bolt directly onto a 4150 intake manifold AND a 4500 (Dominator) series intake manifold with no modifications to the manifold and no adapters required!! Just bolt it on!! With cfm ratings as low as a REAL 1100 cfm, the SV1 is perfect for 650 horsepower on up engines. But the SV1 can be machined to a REAL 1250 CFM and it will still bolt onto a 4150 intake manifold with no adapter required! These are not inflated cfm numbers! However, the SV1 can be machined to flow over 2600 cfm, at that point it needs moved over to a Dominator intake manifold. This makes the SV1, the highest flowing carburetor in the world in both 4150 series designs and Dominator designs! The SV1 Series has a very low profile (it’s shorter than both a 4150 and a Dominator), so you get increased hood clearance. The unique SV1 booster design is less effected by reversion and the excessive richness this condition creates. Current booster designs are negatively effected by reversion and make a carburetor uncontrollably rich as a result. The SV1 booster does not generate signal in both directions so the effect of reversion is greatly diminished or eliminated. No special jets or gaskets are required!! The design uses all standard Holley Jets, metering gaskets, bowl gaskets, base gaskets and seals. Utilizing the same overall length as the 4500 series carburetors allows the end user to utilize the same fuel line fittings and basic linkage setup. It also incorporates the industry standard 4500 Dominator series 7-5/16″ air cleaner flange. Dart style cloverleaf opening intake manifolds interfere with the SV1 single blade and must be cut back for use. 3. ZEX Perimeter (use 4150 for 95mm blade and 4500 fits all sizes). The SV1 uses a Dominator base air cleaner like the Moroso Part # 65920. The SV1 uses CMW 8900 (Callis Machine Works) or Biondo PCTS inline throttle stop (specify big bore cylinder). Increased hood clearance (95mm blade version is 1/2″ lower than a 4150 – ONE INCH lower than a 4500) 110mm blade versions on up are standard height at the air cleaner lip, but 5/8″ lower at the vent tube. Boosters can be custom drilled to enrich or lean out a certain section of the carburetor venturi to fine tune cylinders needs. Air cleaner bracket available (bracket has been test cycled over 1000 times with a 100 lb. load without failure). The bracket extends away from the venturi area to allow the incoming air time to fill and straighten. Perfect for Tunnel ram and Supercharged applications (the single blade offers symmetrical distribution at idle, part throttle and WOT). **View the Competitionplus.com article featuring the SV1 design.